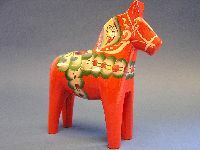 The Story of the Dala Horse A horse represented a creature of great value, a tower of strength in helping the family. It was a faithful friend who pulled loads in the forest during the winter, worked in the field and meadow when Spring and Summer arrived. The horse carried equipment up to the delightful summer pastures and adjoining houses and also provided the daily transport between villages and the countryside, as well as transport for different events throughout the year. Be it trips to the mill, to market, to church, the horse really "pulled its weight", a veritable beast of burden.